Имате въпрос към Hotel Maximillian? Ако това, което търсите е хотел с добро местоположение в Tanjung Balai Karimun, не се колебайте, а изберете Hotel Maximillian. Хотелът се намира на 0.30 km от центъра на града и осигурява достъп до важните места на града. С удобното си местоположение хотелът предлага лесен достъп до всички градски забележителности, които задължително трябва да се видят. Възползвайте се от богатството на ненадминатите услуги и удобства в Tanjung Balai Karimun. Този хотел предлага множество удобства, за да задоволи и най-изискания вкус. Като допълнение всяка хотелска стая предлага широка гама от удобства. Много от стаите са с телевизор с плосък екран, достъп до интернет (безжичен), безжичен интернет достъп (безплатен), климатик, събуждане, за да удовлетворят и най-изискания вкус. Хотелските съоръжения като сауна, спа, масаж, билярд, градина са идеално място за почивка след тежък и уморителен ден. Hotel Maximillian е идеално място за туристи, търсещи чар, комфорт и удобство в Tanjung Balai Karimun. Hotel nice and good location in city. 15 mins walking distance from the ferry terminal. Along the way there are lots of eateries and shops for your leisure and meals coupled with lots of local delicacies. Upon reaching. 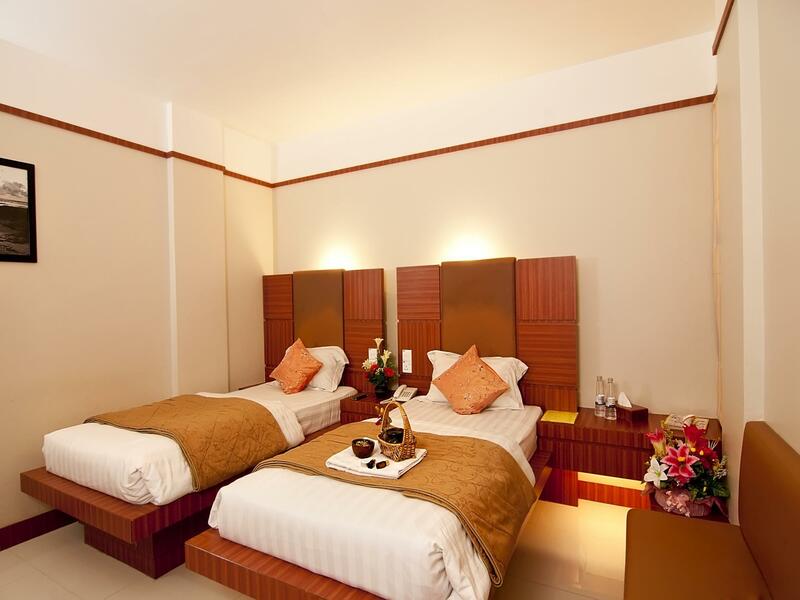 Well dress hotel staffs will open the door to welcome your arrival and friendly front desk staffs will check you in efficiently with minimum hassle. Upon reaching my room. A cosy and cool room was waiting for us. We had a good tub bath coupled with strong water pressure. Aircon was working fine and the chairs and bed was comfortable and clean. The TV reception was clear with good quality English movie and a small fridge which holds a treasure chest of choices and tidbits all laid out nicely to satisfied your every needs in every aspects. We nearly spent our vacation hold up in the bedroom all the way. Hahaha. Within the hotel. 2nd level have Spa & Massage. 7th storey there is karaoke and bar. Lv 1 restaurant is right at the back with open spaces sittings too. My wife and I had a great time. Pros - all facilities provided by the hotel is nice. Have spa, karaoke, breakfast included and comfy room. - nearby all the restaurants and few cafe. Cons - a bit noise from the same floor of guests who stay there. 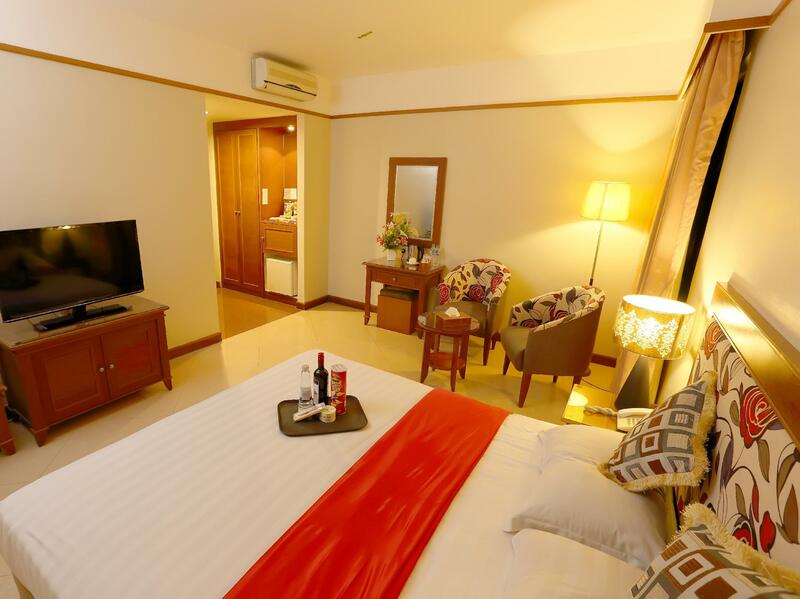 This hotel is near Harbour and is situated in the central of Tg Balai. Beside this hotel have a mini mart(convenient stall that you can get almost everything there), sea food restaurant,bak kut teh & wan tan mee ship just a few walking step only. There are spa,massage,sauna, steam bath, snooker table, karaoke room( with latest Mandarin, Cantonese ,Hokkien & etc song) , a bar at top floor. Lastly, the Staff is helpful and the room is clean. I want to review about this hotel when travel to Tg. Balai Karimun, 24 Nov 2018. : - Your Towel very Bad, Dirty in black color, and very disgusting and smell. - In mini bar, please put mini bar price in one paper, or put in the wall, because there is no price and no confirmation mini bar is free to use or must to charge. - from Terminal ferry to hotel, walking about 1km. - Room is ok, very nice, very clean and comfortable. - AC is very good, cool and nice. - Staff excellent service. I was told to pay by cash at the hotel. When i got back, i check with Agoda Online, the room already being charge to my debit card. Need help in getting back the payment i made to the hotel when i check out. I'm not sure how this hotel can justify their rates; for someone who has stayed in a plethora of hotels in Indonesia, they're a little high and for what? Even the rooms which "come with a harbour view" are a misnomer, as the view they speak of is actually from the shared hallway, not from the rooms themselves. The only plus is the staff, Won't be going back. Rent a motor cycle & zip around the island. You can approach the hotel staff for rental if the it happen that the staff has extra bike to rent. Where to go? Marina square, Ponkar waterfall, nature reserve park, Ponkar beach & Palawan beach. The hotel is conveniently located close to the terminal. Getting food isn't an issue as all is within walkable distance. A bar/lounge is one of the facilities available in the hotel. As such, guest do not have to go out for entertainment at night. We have stayed at the Maxi three times over the last few months and will never stay anywhere else in Tg Balai Karimun. 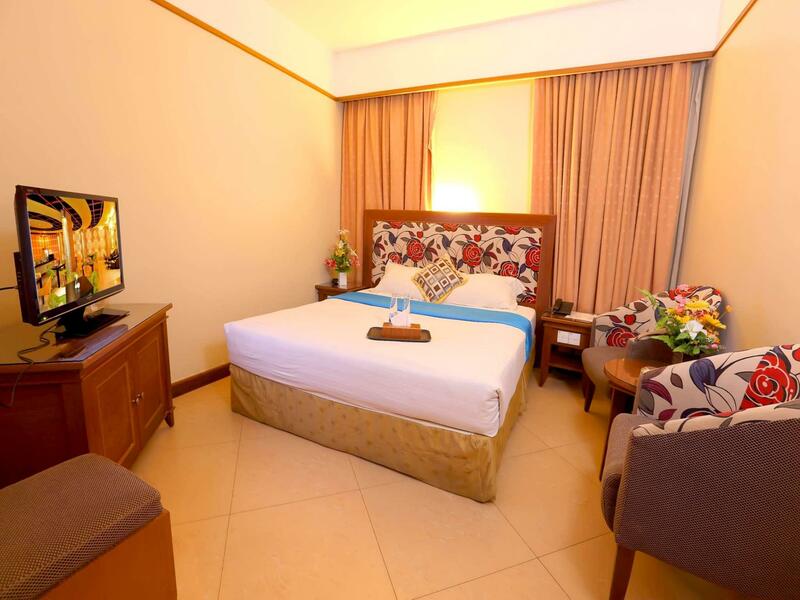 The rooms are well appointed, clean and very comfortable. The staff are friendly and helpful. 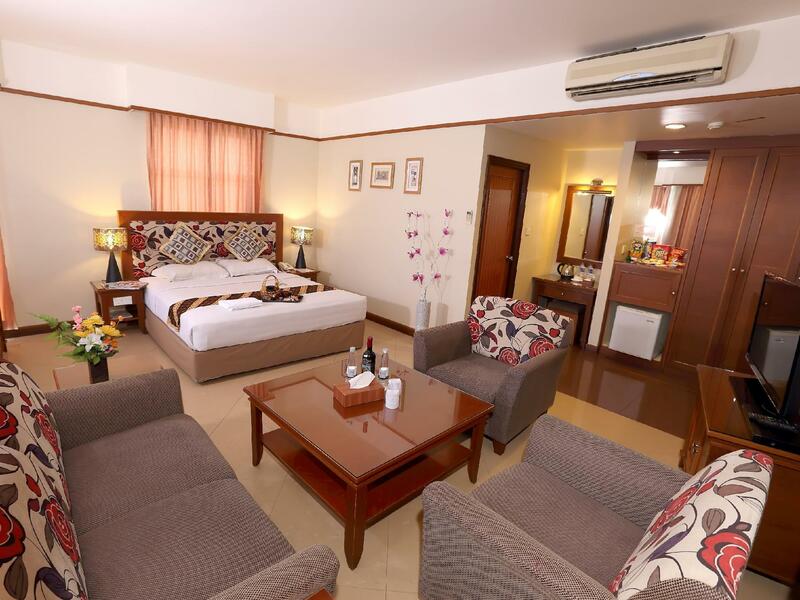 The facilities are great and the location is perfect for staying in the heart of town. I would consider this one of the best hotels in the little town of Balai. It is within walking distance to the ferry terminal, and has all the required amenities within a short walk. From groceries and provisions to club and massage options. There is even a (clean) spa within the hotel. Good food is available within and around the hotel. Only drawback is the KTV bar on the 7th floor, with a VERY loud sound system you can hear reverberate throughout the hotel... even to the spa on the 2nd floor! Good thing is the music stops at midnight (weekdays) so after that one can sleep! Breakfast was sufficiently good. I revisited this delightful island for a short getaway and stayed in Maximillian Hotel again. Its apparent the hotel had upgraded certain aspects, the breakfast has improved, wifi signal is stronger and the rooms now come with new flat screen TVs! This trip, we booked the karaoke room at the hotel and had a great night singing and drinking. The next day, we also had a good massage at the hotel spa located on the second floor. There is a new shopping mall – Indo PN, I believed is the biggest and best in the island, great shopping for toiletries and food. Our family also enjoyed the arcade games and food court on the top floor of the shopping mall. Taking about food, there is a fried chicken fast-food outlet near Maximillian – CFC , very yummy! Its walking distance from the hotel, you may check with the hotel staff how to get there. Anyone thinking of visiting the island and staying at Maximillian, just remember to book early as the hotel is very popular. Everything was great. Except that the wifi at the new wing of the hotel was poor. Nid to go near the hotel room door to be able to get a bar of wifi. Hotel was a bit pricey in summary. Without swimming pool. Spa and etc. aston was a little cheaper with better hotel ratings. I stayed at the deluxe room for 3-nights and then moved to new standard room on 5th floor with ocean view for an additional 3-nights; the rooms are clean and very comfortable, Dinning at the restaurant was excellent and the Front Desk and Staff always friendly and very helpful, Thanks!!! I book for New Deluxe... room facing to bay. Big room... clean and quiet room. Do not book 6 or 7th floor. So noisy due to karaoke and bar located at 7th floor. SPA... sauna and pool located at 2nd floor. Masseur very friendly and with skills. Overall i am satisfied with the hotel. Pls change to new towel. Towel torn and dirty.